Hole eye pig piggy banks (because of the typical hole eyes) were some of the earliest piggy banks manufactured in large quantities . 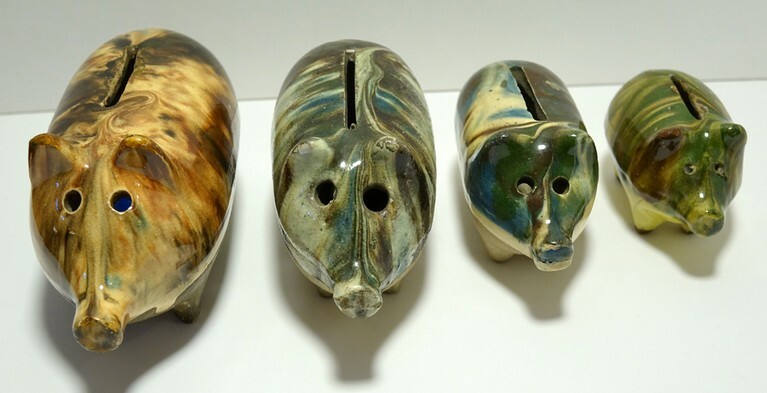 These piggy banks were made from the 1880's through about 1920 and are typically very fragile, due to their age and pottery composition. Most were made in Austria or Czechoslovakia (former Austria-Hungarian Empire. They are typically unmarked, but sometimes can be found marked with the country of origin Austria, Czechoslovakia or Cechoslovakei. They are made of a very light stoneware with an almost glass-type colorful drip glaze over the upper half of the pig bank. This glaze is very susceptible to flaking and as a result, most banks have some type of damage. They come in four distinct sizes from 15,5 cm until 9 cm. 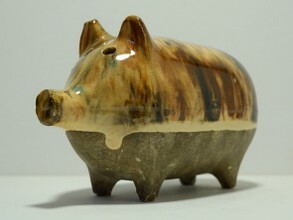 By the way: There are also NEPP piggy banks: None-Eyed Pottery Piggy banks.